If you live in Tokyo, come on down to Tokyo Wonder Site, Shibuya and see one hundred small size paintings and images. WONDER SEEDS is an open competition art fair aimed to connect young artists and potential new art consumers. In this program designed to support young artists following the concept of "buy = support", selected entries of accessible small works (paintings, prints, illustrations, photographs, etc.) from all across Japan are displayed and sold. This year, the works of approximately 100 artists chosen from 964 entries will be exhibited at TWS Shibuya, where visitors can casually purchase affordable artworks that they like. Through WONDER SEEDS, not only young artists will learn the notion of selling their artworks, but also art fans will experience the awareness of art ownership. 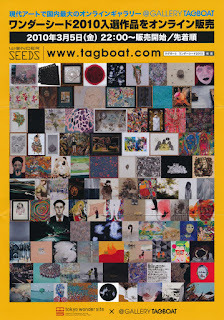 Here is the link to access to Tagboat's website, where you can purchase artworks from Tokyo Wonder Seeds, a competition exhibition organized by Tokyo Wonder Site Shibuya.